Francesco Cavalli, like his teacher, Claudio Monteverdi, is one of the great Italian composers of the seventeenth century. Although Cavalli’s catalog of operas numbers more than 40, almost all have fallen into oblivion, and just a few – such as L’Ormindo, Il Giasone, Xerse and La Calisto – have been performed in the past 50 years. The plot of La Calisto is drawn from Ovid’s Metamorphoses, and the libretto is by Giovanni Faustini. The opera, which premiered at the Teatro Sant’ Apollinaire in Venice in 1651, tells the story of the love affair of Jupiter and the nymph Calisto, a follower of Diana. Jupiter, disguised as Diana, seduces the nymph; when Juno, Jupiter’s wife, discovers this, she turns Calisto into a bear. Finally, Jupiter makes Calista a star in the sky for all eternity: Ursa Major, the Great Bear. 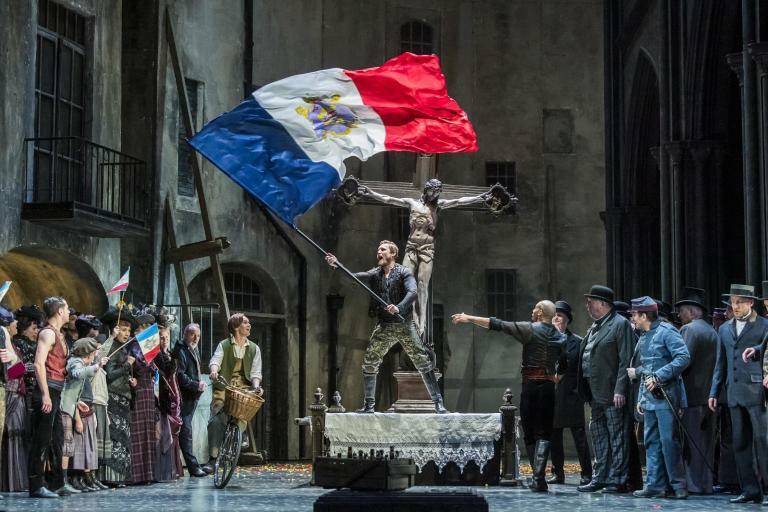 Teatro Real is staging the David Alden production which had its premiere at Munich’s Bayerische Staatsoper fourteen years ago, and it is outstanding. The action is brought up to current times and takes place in a sort of luxury brothel. A series of colorful mobile elements on the brightly-lit stage allow for quick scene changes, and the costumes are also quite fun as well as attractive. The lighting is a fine complement to it all. Mr. Alden’s stage direction is superb, and the soloists and extras are great collaborators. These seventeenth-century operas demand a lot of imagination on the part of the director, and here one can say that imagination, color and good taste (with some excesses) were always present. Ivor Bolton was in charge of almost all the performances in Madrid, as he had been earlier in Munich, and his conducting seems to me worthy of being highlighted. He knows the opera perfectly, and his reading had emotion too. In the second cast, Christopher Moulds, another expert in Baroque music, was in the pit. He gave a good reading of the opera, although for me it was not quite at the level of Mr. Bolton’s. The orchestra was praiseworthy on both days. Two vocal casts have been programmed, and Calisto was played in the first one by soprano Louise Alder, who gave a good performance in terms of both singing and acting. In the second cast, soprano Anne Devin was excellent. Her voice is appealing and well-handled, and she moves with ease on stage. There were two strong countertenors in the role of Endimione: Tim Mead, who has an attractive voice, and Xavier Sábata, who sang with gusto. Monica Bacelli in the part of Diana gave a remarkable performance, and Teresa Iervolino in the second cast made a very positive impression. Baritone Luca Tittoto did well in the part of Giove, and I preferred his performance to that of Wolfgang Schwaiger in the second cast. Soprano Karina Gauvin was Giunone, and she has an attractive voice, although she falls short in the lower notes and was somewhat tight at the top. Rachel Kelly in the second cast was well-suited to the role. Mercury was played by baritone Nikolay Borchev in the first cast, and an excellent Borja Quiza in the second cast. It was the best performance I can remember from him. Guy de Mey gave life to Linfea and was fun to watch, although I preferred the interpretation of Francisco Vas in the second cast. Ed Lyon was quite good as Pane, with a larger voice than Juan Sancho in the second cast. Countertenor Dominique Visse was an amusing Satirino on stage, and doubled as La Natura in the Prologue. Finally, bass Andrea Mastroni showed his powerful voice as a sonorous Silvano.